Dhivya Shree Shakthi is Hyderabad first luxury integrated township that aims to combine the serenity and warmth of village life with the fine nuances of modern living. The project stands tall in Miyapur, one of the fastest growing areas of Hyderabad. A residential project of 11 nine-storied towers rising majestically from an 18-acre plot, and standalone multilevel spaces for shopping, entertainment, corporate offices, transit living and healthcare, Dhivya Shree Shakthi is designed to be Hyderabad very own Villaggio Le Torri (Italian for Village of Towers). Dhivya Sree Shakthi, is a residential APARTMENT Project is located at Miyapur, Hyderabad. Property adviser team started following Dhivya Sree Shakthi from 29 Apr 2016. This APARTMENT has 3BHK, 4BHK Flats with total built-up area ranging from 1956 Sq. Ft to 3152 Sq. Ft constructed by DHIVYA SHREE SHAKTHI. Out of 439 units, 400 units are available. The price of the APARTMENT ranges from Rs. 1.03 Crores to Rs. 1.65 Crores at Rs. 5000/- Price per square feet. Till now, our team visited Dhivya Sree Shakthi 34 times. Our most recent project visit was on 05 Apr 2019 when we collected details about price changes, available units and took photos showing the progress of construction, materials used, and so on. So far, the project has 179 photos starting from the early stage of construction till the date of possession. There are photos of the street view, flat floor view, elevation, roads, parks, and so on. Property Adviser Team will revisit the project on or before 06 May 2019. 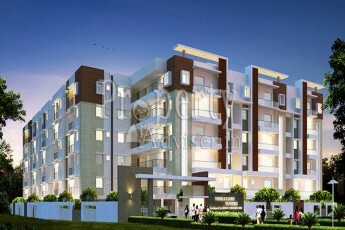 This Project is approved by GHMC, which is spread over an area of 18 Acres land area with total of 9 Floor. Dhivya Sree Shakthi project has Bank Loans available from HDFC, LIC, SBI, AXIS, ICICI, SYNDICATE bank(s). 3BHK East facing flats are available with 100 units for sale out of 109 units. 3BHK West facing flats are available with 100 units for sale out of 110 units. 4BHK East facing flats are available with 100 units for sale out of 110 units. 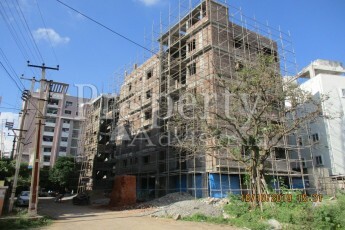 4BHK West facing flats are available with 100 units for sale out of 110 units. The Dhivya Sree Shakthi project is elegantly designed with modern amenities such as Swimming Pool, Childrens Play Area, Tennis Court, Car Parking, Net Cricket, Club house, Multipurpose Hall, Intercom Phone, Power Backup, Temple, Cooking Gas Pipe Line, and so on. The apartment has all the modern amenities that will ensure that you don't have to step out of your apartment to enjoy all these facilities. 179 Progress Photos from Last 34 Months are Available. Till now the project is updated 34 times and has 179 construction photos with street view, flat floor view, elevation, roads, parks etc. The residential project is located at Miyapur, Hyderabad. Avail Seller Contact Details on one click to get your dream home site visit. This Project is constructed by DHIVYA SHREE SHAKTHI, reach seller by Contacting to Anjali. You can reach them on these numbers or visit them to view model flat and finalize your dream home.